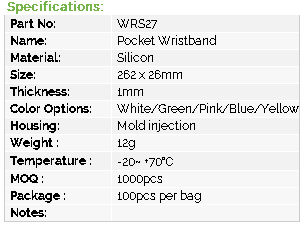 Click the button below to add the WRS27 Pocket Wristband Silicon for SIM Card or NFC Tags to your wish list. RFID wristband is the extension products of normal card, which is designed for easy carrying by person in swimming pool, construction place, pub, hospital, gym center, etc. It combines the RFID and NFC technology with good looking and practical housings, completely water-proof. GYRFID present several types of wristbands to fit different customer's demands. Material options: ABS/ PC/ Rubber/ Silicon/ Flexible Plastic / Paper/ PVC etc. This kind of Silicon wristband is without RFID or NFC chips, it is pocket wristband to contain the SIM Card or tags with size 23x23mm.